As a child, I always picked violets for my mom in the spring. She would happily accept the gifts and put the dainty little purple and white flowers in a glass of water on the kitchen window sill. Where to grow it: Violets prefer to grow in damp areas like wet meadows and damp woods. What to grow it with: Violets are lovely as a woodland path border. Try planting violets with her NW native forest friends: wild ginger, western bleeding heart, bunchberry, trillium, salmonberry, thimbleberry, evergreen huckleberry, red huckleberry, vine maple, red flowering currant, Indian plum. 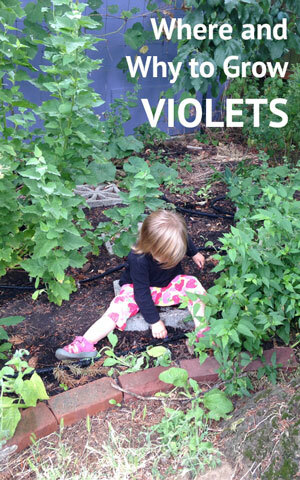 Maintenance: Violets are very low maintenance. I have several volunteer plants in my garden, which I've transplanted once or twice in the spring. They are easily established, just make sure to give them regular water for the first season. Food: Both young violet leaves and the flowers are edible. They can be eaten raw as a trailside snack or mixed with other greens. Also try the leaves steamed or simmered in hot water. Note: Some species of yellow violet may have a laxative effect. Medicinal: Violets are not a strong medicine alone, but they do help enhance the medicinal properties of other plants. Violet leaves are high in vitamin C.
Spiritually, violets are teachers of inner awareness and communication. I have found this to be true for myself. At an annual Plant Medicine Gathering in Portland, OR, one exercise during a workshop I attended was to meditate on an experience we had with a plant as a child. The purpose of this exercise was to reestablish the natural curiosity and connection we had with plants as children. The first memory that came to mind was picking violets for my mom. I went back to that experience in my mind and greeted the violets. To my surprise, a violet fairy emerged and was so pleased to see me again. This experience confirmed my innate connection with plants and ability to access my inner awareness. fresh flowers as decoration on cakes, pastries, in lemonade, etc. I'd love to hear from you! In what ways do you use violets? Newer PostWhat Should You Plant in Your Edible Container Garden?